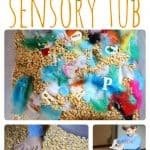 Monster Sensory Tub - I Can Teach My Child! This was definitely our favorite sensory tub yet! Even I enjoyed digging around in it! We used water beads, which I first learned about from my friend Julie’s blog. She found the idea on Play At Home Mom. These little water beads are the absolute coolest things! They are water-retaining polymers that keeps their shape and are slippery to the touch. They are non-toxic (though you need to supervise at all times since they could be a choking hazard–so don’t do this activity with children younger than 3) and can be used again and again. Just store in an air-tight container and add a little water the next time you want to play with them. Some (like mine) come already hydrated and others you’ll need to add water and let them “grow” for a few hours. You can find them in the floral department of most stores and usually run a couple of dollars (or you can find the kind that you add water to here). A few dollars well spent, mind you! For a little monster fun, I threw in some large wiggly eyes, which we received for free from Craft Project Ideas. I ended up using two containers instead of just the one shown. Mine were already hydrated, but I think you can buy them “dry” and you just add water. Having tons of fun in the water beads! In case you’re wondering…they don’t stain your hands or your clothes (at least this brand, anyway). Have you tried water beads??? If so, what did you think? They actually sell those beads at the Dollar Tree where I live. I can’t remember what they are called but they are on the craft/floral aisle. They only have clear ones. But I will definitely try them! I think my son will love them. Thanks for the idea! Thank-You! I found them at Dollar Tree~! I’m an OT and my kids are going to love this! <3 (tried it at home and even my 12 y.o was testing" them out lol! 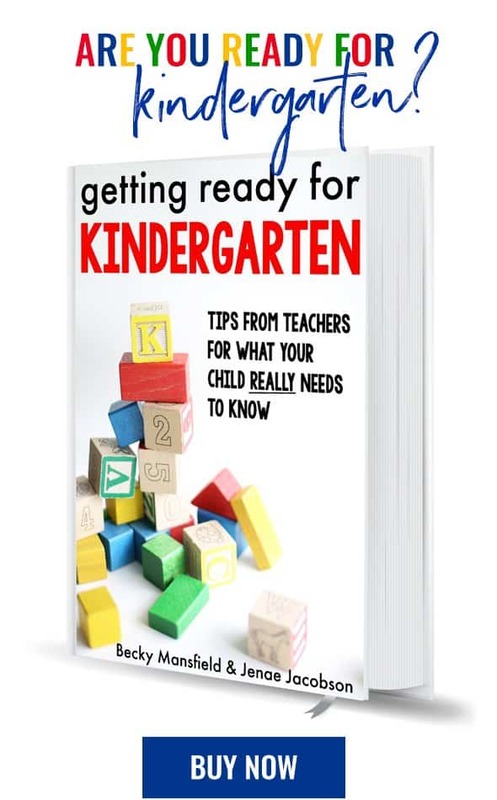 You should gift them – her class would LOVE them too! I tried to find them today but couldn’t so I am off to search again tomorrow after school:) I am on a mission – LOL! Thanks! Just ordered some. Super excited to try it out with the girls! You always seems to have the greatest ideas! I’ve been wanting to try these!! Now I really need to!!! They look like tons of fun! A little girl at our farmer’s market was selling these not too long ago! What a cool idea! I love it! Please come and link up to It’s Playtime. It’s a fabulous idea to share! I LOVE this! It is so fun. I can just see the excitement in those little hands! I just pinned it onto my pinterest board for all to see! What great Halloween idea. I’m gonna Pin It! Great idea!!! My son has a sensory disorder and I am going to get the foam shapes and alphabet letters, put them in with the beads and let him go to town! Whatever he picks up out of there he has to tell me what it is. Love the idea! Where did you purchase your Aqua Gems? I just went to AC Moore and they don’t have the prehydrated beads, but they did have the small beads you need to add water to but I am afraid the colors may stain my little boys’ hands. What a wonderful idea! We live in The Netherlands, and I had never heard of the water beads. An internet search resulted into nothing..but…at our local nursery they sold ‘water pearls’ kind where the water is already added. My son loved it! He was very tentative at first..just used 1 finger but it did not take him long to become brave and use both his hands. Thnx for sharing the great idea. The dried ones won’t stain your hands, They are the same as the wet ones and they are cheaper. Just be careful to not keep them in an airtight container. They will start to smell if they don’t get some air. I have 4th and 5th graders and they love them! I checked these out in the store today b/c I thought the activity looked fun. I’m curious how the package can say both “non-toxic” and “contains chemicals proven to cause cancer and birth defects in the state of California.” I chose NOT to buy because of the horribly mixed messages . . . I too thought this was a great idea for my home bound autistic student. He would love it. I bought 2 different kinds. The clear ones I bought at Dollar Tree just said non toxic, but the colored beads I bought at Wal Mart ( I later noticed) said contains chemicals proven to cause cancer and birth defects in the state of California. How do we know any of them are safe?. I want to use these but have concerns. What do the rest of you think? Regarding the warning label on the beads. California takes a more precautionary approach. In the USA, we have a 35 year old law (toxic substances control act or TSCA) that regulates chemicals in our country . The law is very broken, in fact, legislation has been introduced fairly recently to update it because it is so out of date. 80,000 chemicals are registered yet I believe only a few hundred have actually been tested for safety. In our country chemicals have to be proven harmful before they are regulated. In Europe and other countries chemicals have to be proven safe before they are put into use. A BIG difference!!! This product wasn’t designed for children to handle, it is for plants. No it isn’t toxic so you are going to notice anything bad if your kid handles it. However, many scientist believe in a link between cancer and environmental exposures to toxic chemicals. California says this product contains a chemical known to cause cancer, that is why it has a warning label. If you are the parent or teacher that believes in the precautionary principal than I would find an alternative to these beads. Another blog mentioned tapioca pearls. In addition to these concerns, they are serious chocking hazards. The beads swell when exposed to moisture….a bad combination when swallowed by curious youngsters. we are playing with water beads in our sensory bin and I have soaked them in a yellow highlighter. playing the beads in the darker room with black light was great fun for the beads were glowing in the dark and the kids touch, scoop, pour etc. I know that water beads are non-toxic but on the packet of my water beads that I purchased at Walmart read “WARNING: This product contains chemicals known to the State of California to cause cancer and birth defects or other reproductive harm.” Is this warning something to worry about? Absolutely love this idea. Will definitely use this one in our summer reading program at the library for the toddlers. Our theme this summer is “Dig into reading”. Someone gave my teenaged boys a cup of these and they played with them for days. I know the little ones will “dig” as well. This is great for developing kids fine motor skils. A popular sensory tub in my classroom. My 3-4 yr old students loves the cool, soft, jelly feeling of the water beads in their hands. They like the challenge of squishing/squashing them. I provide clear plastic bottles, sometimes glass bottles too, for them to fill with water beads. Some kids fills the bottle with one color beads, others even try to make patterns.